The Ministry of Defense office configuration shows a SESAM Server and a SESAM Workstation installation. This configuration allows controlling and monitoring all systems together: Video, Access-Control, and Security. The SESAM Server has up to 16 cameras connected, VMD and a video recording system is included. Video can be recorded as a result of VMD triggering, continuously or as a result of PIR detection. Access control Hand-key readers are connected to the SESAM Server, up to 31 controllers on a loop, and various numbers of loops can be connected to the computer. 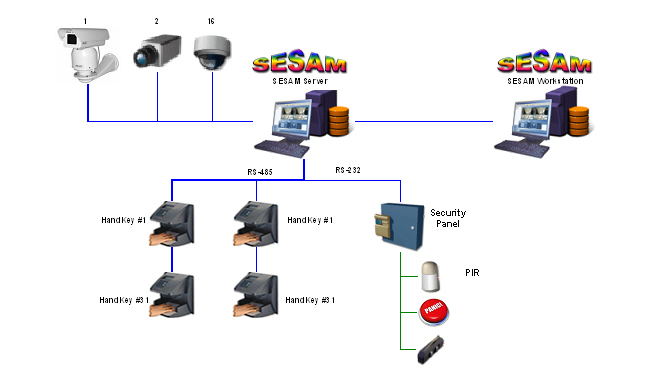 Security systems are also connected to the SESAM Server. SESAM Workstation is connected to SESAM Server over a LAN. Full control of the entire system is available from both the Server and workstation. Different users can be limited to perform specific set of operations and not administrative actions.